Lucky you! March/April is the perfect time to be in Melbourne. It's the time of year when locals head to the city more than usual, when our interstate and international friends join us and the streets come alive as comedy plasters the city from end to end. There are many reasons to visit Melbourne during one of the biggest comedy festivals in the world. You'll enjoy a wonderful array of choice with hundreds of shows, ticket prices averaging at $30 and free family entertainment. To complete your escape there's Melbourne's famous food and drink, fashion and arts scenes, and sumptuous wineries and beautiful beaches are just a day trip away. To make the process that little bit easier, we’ve put together a handy guide to help you get the most out of Melbourne. It’s as easy as A-B-C! (Well, actually it’s P-R-F-C-S-B, but you get the point). With hundreds of awesome local and international artists descending on Melbourne for the Festival, it’s important to plan out who you’re going to see. We suggest booking in a few key shows, then going with the flow and filling in the gaps once you’re here. New shows are going on sale every week, so keep an eye on the website and socials for updates. You can also visit our YouTube channel for some inspo on your favourite artists and styles. Still can’t decide? Book yourself into a special event or line-up show to give you a taster! All shows will be available to book through our website. If you prefer phone, booking agents vary for each show so check individual show listings for details and contact numbers. 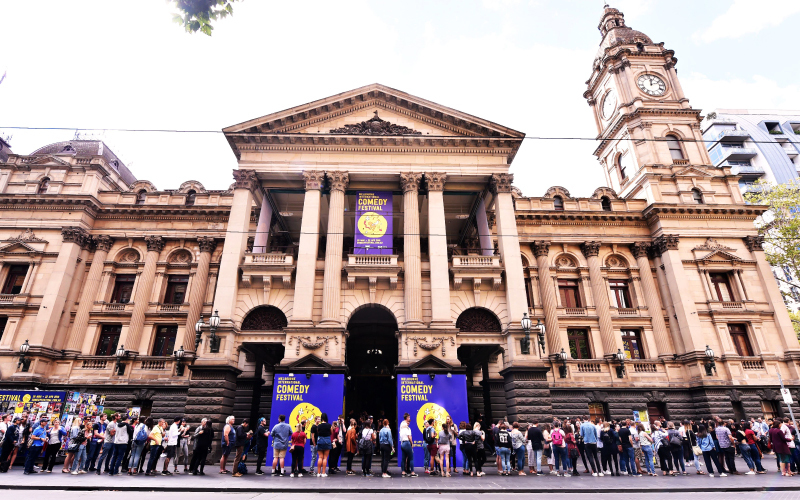 During the Festival dates you can buy tickets from most venues on the night (subject to availability), or head to our main Collins Street Box Office – you can book hundreds of shows there (but not all, so do check individual listings). You’ll need a place to lay your head between all this fun and laughter. Lucky for you we’ve got some fabulous accommodation sponsors just waiting to greet you! Just a few steps from Melbourne Town Hall at 205 Collins Street lies the luxurious Westin Melbourne. Enjoy five-star service and amenities, delicious comedy cocktails and more, all while being right in the heart of the comedy action. For some stylish apartment living, adjacent to the Melbourne Town Hall, head to Collins Hotel Apartments at 182 Collins Street (next to the Athenaeum Theatre). The lovely folks at the Mantra Group offer a special 15% off room nights to all Festival guests when you book online for the Festival dates using the promo code MICF19. The Mantra Group provide top-notch accommodation at various convenient locations around the city and beyond – check out Mantra on Russell (also a Festival show venue! ), Mantra on The Park, Mantra 100 Exhibition, Mantra Little Bourke, Peppers Docklands, Mantra Southbank and Mantra St Kilda Road. Want to keep your cash for comedy and still get a good nights’ rest? We recommend Travelodge, a super-affordable option with all the accommodation essentials. Visit their convenient locations in Southbank (near Arts Centre Melbourne) and Docklands. Coffee. Food. Cocktails. More Coffee. What Melbourne escape would be complete without a tasty food or drink discovery? Don’t worry, it’s not all deconstructed dinners and avocado lattes. We work with a range of awesome drinking and dining partners - they’re close to loads of Festival venues, and many offer exclusive specials for those with a valid Festival ticket. Browse the list of offers here! Driving to see a show? Our friends at Secure Parking have amazing CBD parking deals available for use during the Festival. Check out special Comedy Festival parking pricing here. Why not let someone else do the driving? The PTV Journey Planner, available on the PTV App or at ptv.vic.gov.au, will help you get to the Festival on Melbourne’s trains, trams and buses. The V/Line is your link to the city from regional Victoria, for more information visit vline.com.au or call 1800 800 007. Major planned works will be occurring on multiple train lines over the course of the Festival and school holidays. Click here to check if your line is affected. Buses will replace trains on these lines – we suggest you allow extra time for travel and, if possible, use alternative routes. The PTV Journey Planner can also help. The Festival is open late and public transport is too. The Night Network provides all-night services every Friday and Saturday on metropolitan trains, trams, buses and regional coaches. You can catch a late show, head to the Festival Club and still get home! You’ll need a myki to travel on public transport – it’s your reusable travel card for trains, trams and buses in Melbourne and regional Victorian centres. Top up before your journey, and don’t forget to touch on and off as you travel! The PTV website has more information. There’s so much to explore in Melbourne, so be sure to pair your laughs with lots of other activities! Melbourne is a cosmopolitan and vibrant city that thrives on sport, culture and festivals - playing host to events all year round. Arts, film, fashion, sport, food, wine, nature and more – the options are endless so get out and explore! Click here to search for everything that's happening in Melbourne. But be warned... one trip won’t be enough! Beyond Melbourne, Victoria offers some of Australia's most beautiful and diverse landscapes, all within easy reach. Discover spectacular coastlines, wildlife reserves, award-winning wineries, surf beaches, rainforests, coastal villages, rejuvenating hot mineral springs and spectacular alpine scenery… all just a few hours' drive from the city. Head to Visit Victoria to discover more!